‘Awesome’ to finally turn the tables on Taylor, says Mira Potkonen. Potkonen, left, celebrates after knocking out Taylor on a split decision. MIRA POTKONEN SET her sights on even bigger glories as her shock win against Olympic champion Katie Taylor started to sink in. Potkonen guaranteed Finland’s first medal at the Rio 2016 games with a stunning split decision win against Ireland’s champion in the quarter-finals. It secures a bronze medal at minimum for the 36-year-old, who now faces China’s Junhua Yin in Wednesday’s semi-finals with a chance to upgrade to silver or gold. After four tense rounds, Taylor and Potkonen each won a card 39-37 but Ecuadorian judge Clemente Carrillo scored it a 38-38 draw and then split the tie in favour of the Finn. As they waited for the decision, Potkonen had no idea if she had won the fight or not. While Taylor’s camp fumed at the scoring of the fight, Potkonen made it clear that she can go even further in this tournament. 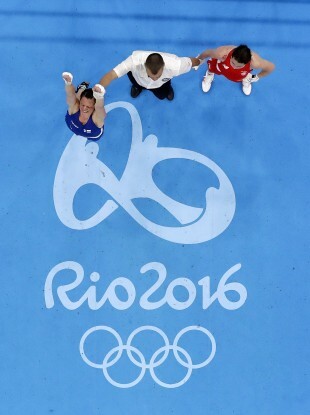 Was this her greatest day in the ring? Email “'Beating Taylor is not my greatest moment - that's still to come'”. Feedback on “'Beating Taylor is not my greatest moment - that's still to come'”.